Howdy folks, thanks for being here. Today I was faced with another challenge, sharpening a knife with a convex edge. 3. Water Stones and free hand sharpening. I ditched the idea of the belt sander, I don't like sharpening knives with one, I use one for repairs only but not sharpening. I was always sceptical about the mouse pad thing, it sounds pretty gimmicky to me but I do happen to have some very nifty micro abrasives with adhesive backs in extremely high grits, so I had that in my back pocket. I went with the 3rd option of using my beloved water stones. I watched a video by Murray Carter where he describes a rocking motion as you sharpen so I did this. I also paid extremely close attention to what I was doing, I did NOT want to change the grind on this knife, it is very special to the owner. This is the most convex convex edge I have ever seen. 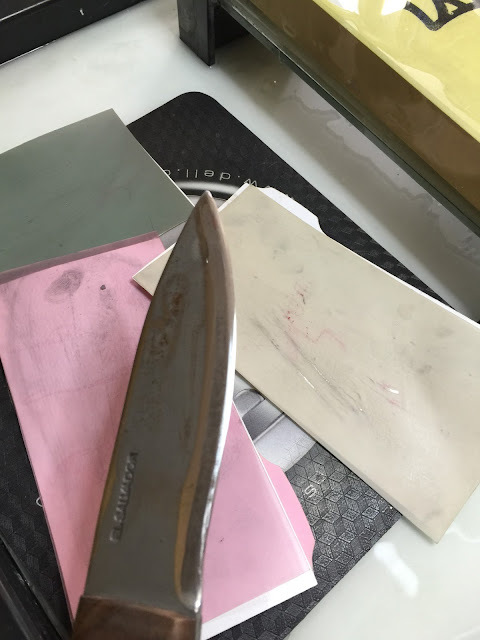 I practised on a big Buck hunting knife I was given and was very pleasantly surprised at the results Holy buck, the abrasives that you see in the picture put a beautiful polish on the bevel and the knife got sharp very quickly. The abrasives that you see in the picture put a beautiful polish on the bevel and the knife got sharp very quickly. Holy Buck. So I went to work on the knife and used a combination of stones and abrasives on the pad, it turned out very well and is very sharp. So if you want to sharpen a convex edged knife, it really isn't that hard and you don't really need the water stones, the Buck knife I did wasn't very sharp and the abrasives put a great edge on it. This is not a convex edge, I used the Edge Pro Professional on this one.